Sayagyi U Ba Khin was born in Rangoon, the capital of Burma, on 6 March 1899. He was the younger of two children in a family of modest means living in a working class district. Burma was ruled by Britain at the time, as it was until after the Second World War. Learning English was therefore very important; in fact, job advancement depended on having a good speaking knowledge of English. Fortunately, an elderly man from a nearby factory assisted U Ba Khin in entering the Methodist Middle School at the age of eight. He proved a gifted student. He had the ability to commit his lessons to memory, learning his English grammar book by heart from cover to cover. He was first in every class and earned a middle school scholarship. A Burmese teacher helped him gain entrance to St. Paul’s Institution, where every year he was again at the head of his high school class. In March of 1917, he passed the final high school examination, winning a gold medal as well as a college scholarship. But family pressures forced him to discontinue his formal education to start earning money. His first job was with a Burmese newspaper called The Sun, but after some time he began working as an accounts clerk in the office of the Accountant General of Burma. Few other Burmese were employed in this office since most of the civil servants in Burma at the time were British or Indian. In 1926 he passed the Accounts Service examination, given by the provincial government of India. 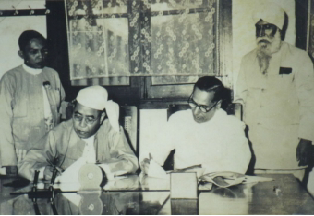 In 1937, when Burma was separated from India, he was appointed the first Special Office Superintendent. It was on 1 January 1937, that Sayagyi tried meditation for the first time. A student of Saya Thetgyi—a wealthy farmer and meditation teacher—was visiting U Ba Khin and explained Anapana meditation to him. When Sayagyi tried it, he experienced good concentration, which impressed him so much that he resolved to complete a full course. Accordingly, he applied for a ten-day leave of absence and set out for Saya Thetgyi’s teaching centre. Now, over fifty years later, when Vipassana meditation is freely available to seekers in many countries all over the world, it may seem strange to contemplate that in Burma, at that time, meditation teachers were rare. Lay teachers were even rarer. Saya Thetgyi had studied and practiced for 14 years under the guidance of Ledi Sayadaw, a well-known monk, meditation teacher and renowned Pali scholar. 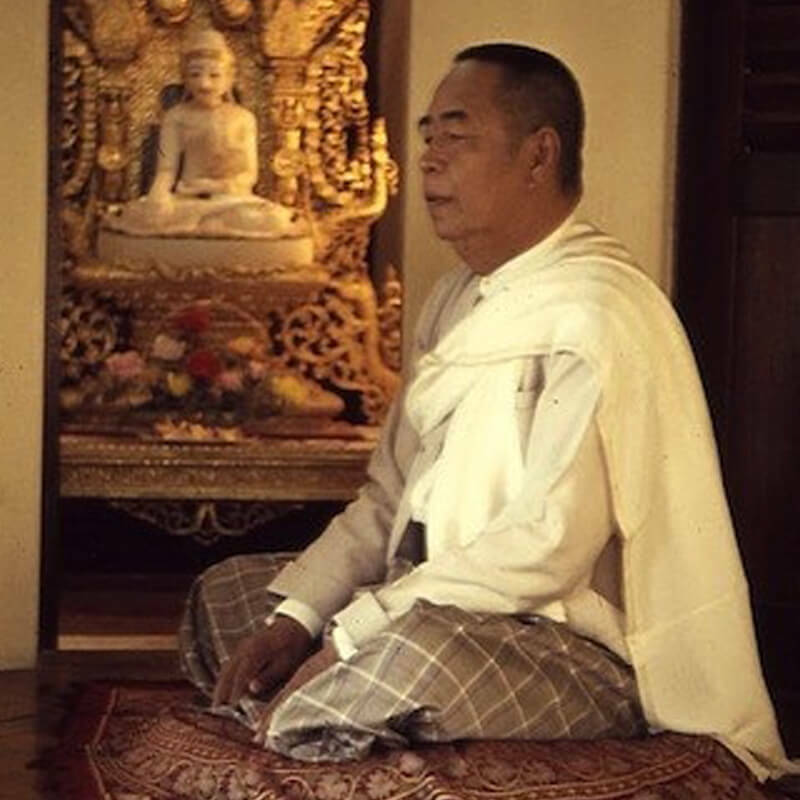 Before coming into contact with Ledi Sayadaw, Saya Thetgyi had practiced only Anapana for seven years because he was unable to find a teacher who could instruct him in Vipassana. It is a testament to U Ba Khin’s determination to learn Vipassana that he left the headquarters on short notice. His desire to meditate was so strong that only one week after trying Anapana, he was on his way to Saya Thetgyi’s centre at Pyawbwegyi. The small village of Pyawbwegyi is due south of Rangoon, across the Rangoon River and miles of rice paddies. Although it is only eight miles from the city, the muddy fields before harvest time make it seem longer; travelers must cross the equivalent of a shallow sea. When U Ba Khin crossed the Rangoon River, it was low tide, and the sampan boat he hired could only take him to Phyarsu village—about half the distance—along a tributary which connected to Pyawbwegyi. Sayagyi climbed the river bank, sinking in mud up to his knees. He covered the remaining distance on foot across the fields, arriving with his legs caked in mud. That same night, U Ba Khin and another Burmese student, who was a disciple of Ledi Sayadaw, received Anapana instructions from Saya Thetgyi. The two students advanced rapidly, and were given Vipassana the next day. Sayagyi progressed well during this first ten-day course, and continued his work during frequent visits to his teacher’s centre and meetings with Saya Thetgyi whenever he came to Rangoon. When he returned to his office, Sayagyi found an envelope on his desk. He feared that it might be a dismissal note but found, to his surprise, that it was a promotion letter. He had been chosen for the post of Special Office Superintendent in the new office of the Auditor General of Burma. In 1941, a seemingly happenstance incident occurred which was to be important in Sayagyi's life. He had been promoted at the beginning of that year to the post of Chief Accounts Officer, Burma Railways Board. One of his duties was to travel on the Rangoon-Mandalay line auditing accounts for local stations. He travelled in a special carriage for the chief accountant, with full facilities for office work and sleeping overnight. His carriage would be attached to the main train, then detached at various stations. One day in July, by error his carriage was detached at a station in the town of Kyaukse, 40 miles south of Mandalay. Although he was not scheduled to audit the accounts here, as Accounts Officer, he was permitted to check the accounts of any station, and he proceeded to do so. After his work was over, he decided to visit the nearby Shwetharlyaung hill and set out with the local station master. From the top of the hill they could see a cluster of buildings in the distance. They recognized it as the monastery of Webu Sayadaw (who later on became known, and was widely respected in Burma for his attainments in meditation). They decided to go to the monastery. At about 3:00 p.m. they arrived at the compound. An old nun sat pounding chillies and beans, and they asked her if they could pay respects to the Sayadaw. "This is not the time to see the reverend Sayadaw," she said. "He is meditating and will not come out of his hut until about six o'clock. This monk does not entertain people. He only comes out of his hut for about half an hour in the evening. If there are people here at this time he may give a discourse and then return to his hut. He will not meet people at times they may wish to meet him." U Ba Khin explained that he was a visitor from Rangoon and that he did not have much time. He would like very much to meet Webu Sayadaw. Would it not be possible to pay respects outside? The nun pointed out the hut, a small bamboo structure, and the visitors went there together. Sayagyi knelt on the ground and said, "Venerable Sir, I have come all the way from Lower Burma, Rangoon, and wish to pay respects to you." To everyone's astonishment, the door to the hut opened and the Sayadaw emerged, preceded by a cloud of mosquitoes. Sayagyi paid respects, keeping his attention in the body with awareness of anicca. "What is your aspiration, layman?" Webu Sayadaw asked Sayagyi. "My aspiration is to attain nibbāna, sir," U Ba Khi replied. "Nibbāna? How are you going to attain nibbāna?" "Through meditation and by knowing anicca, sir," said Sayagyi. "Where did you learn to be aware of this anicca?" Sayagyi explained how he had studied Vipassana meditation under Saya Thetgyi. "You have been practicing Vipassana?" "Yes, sir, I am practicing Vipassana." Webu Sayadaw questioned him closely and Sayagyi gave the details. The Sayadaw was very pleased. He said, "I have been meditating in this jungle alone for years in order to experience such stages of Vipassana as you describe." He seemed astonished to encounter a householder who had reached advanced proficiency in the practice without being a monk. Webu Sayadaw meditated with Sayagyi, and after some time said, "You must start teaching now. You have acquired good pāramī, and you must teach the Dhamma to others. Do not let people who meet you miss the benefits of receiving this teaching. You must not wait. You must teach-teach now!" With a Dhamma injunction of such strength from this saintly person, U Ba Khin felt he had no choice but to teach. Back at the railway station, the station master became his first student. Sayagyi instructed him in Anapana meditation in his railway carriage, using the two tables of the dining compartment as their seats. Sayagyi’s government service continued for another twenty-six years. 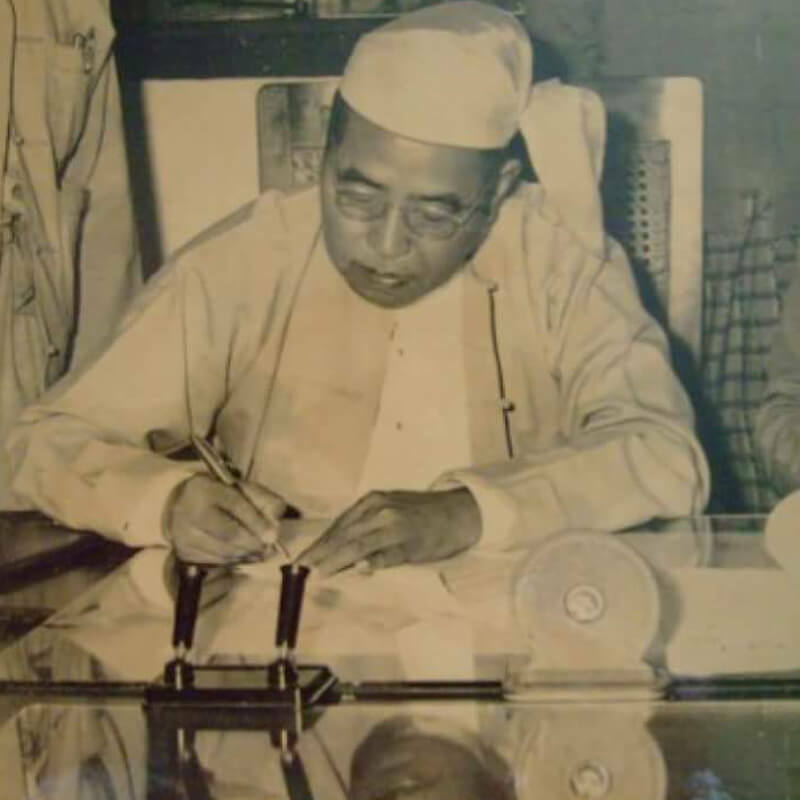 He became Accountant General on 4 January 1948, the day Burma gained independence. For the next two decades, he was employed in various capacities in the government, most of the time holding two or more posts, each equivalent to the head of a department. At one time he served as head of three separate departments simultaneously for three years and, on another occasion, head of four departments for about one year. 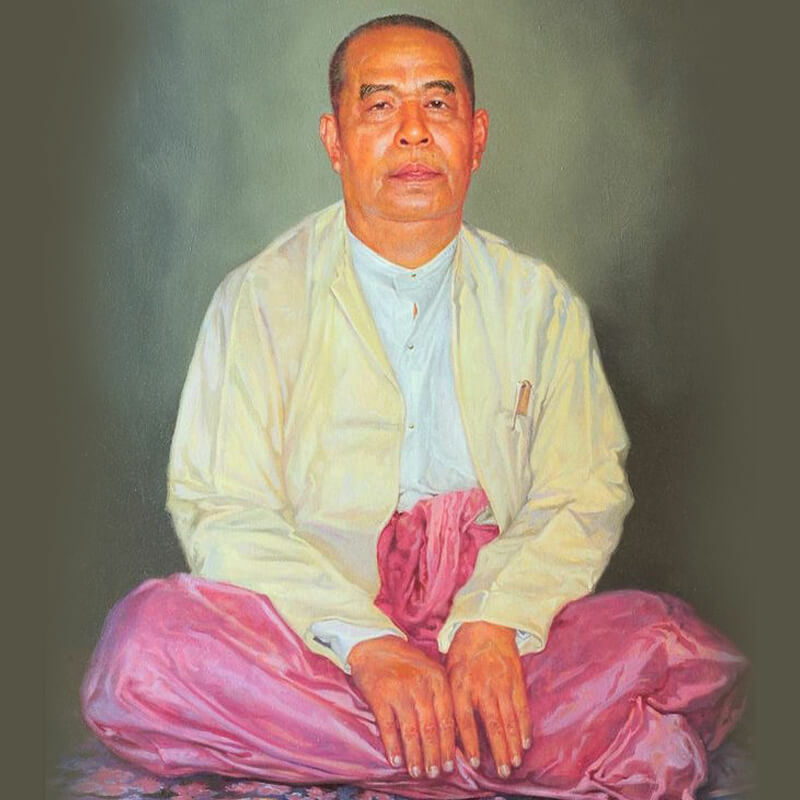 When he was appointed as the chairman of the State Agricultural Marketing Board in 1956, the Burmese government conferred on him the title of “Thray Sithu,” a high honorary title. Only the last four years of Sayagyi’s life were devoted exclusively to teaching meditation. The rest of the time he combined his skill in meditation with his devotion to government service and his responsibilities to his family. Sayagyi was a married householder with five daughters and one son. In 1950 he founded the Vipassana Association of the Accountant General’s Office where lay people, mainly employees of that office, could learn Vipassana. In 1952, the International Meditation Centre (I.M.C.) was opened in Rangoon, two miles north of the famous Shwedagon pagoda. Here many Burmese and foreign students had the good fortune to receive instruction in the Dhamma from Sayagyi. In 1953, Webu Sayadaw accepted an invitation to come to I.M.C. for a week with his entourage of monks to meditate and to give mettā. Until that time, he had confined his travels to only three places: the meditation compounds in Kyaukse and Shwebo, and the village he was born in, Ingyinpin. 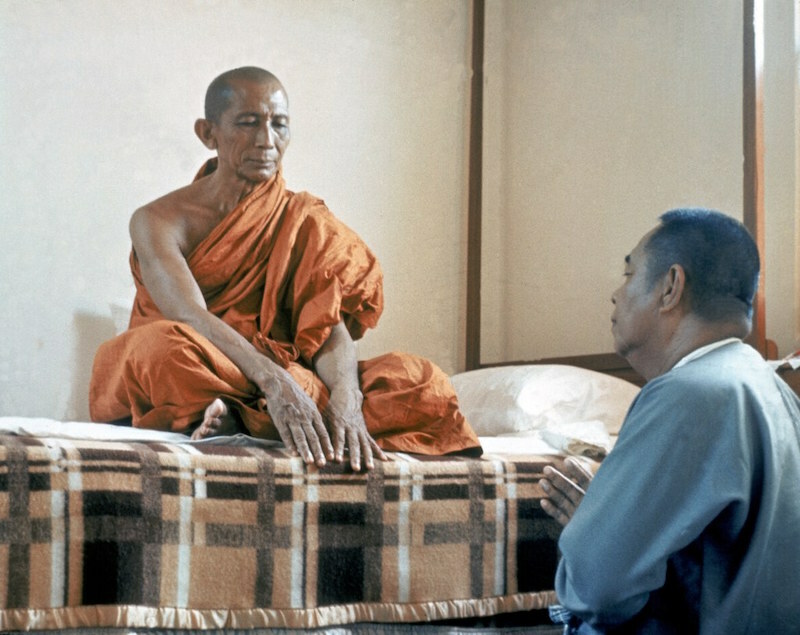 This visit demonstrated Webu Sayadaw's high regard for Sayagyi, since it was unusual for a monk to stay at the meditation centre of a lay teacher. At one time, Sayagyi decided to fulfill the Burmese tradition of becoming a monk at least once in one's lifetime. Without notifying anyone in advance, he and a Burmese student of his went to Webu Sayadaw's centre at Shwebo and, under Webu's guidance, took robes for a period of ten days. Between the years of 1954 and his death in 1977, Webu Sayadaw made regular annual visits to towns in southern Burma to teach Dhamma. During Sayagyi's lifetime, he periodically visited I.M.C. as well. The Sayadaw was held to be an arahant (fully enlightened being), and it was a high honour for I.M.C. to receive him. When Webu Sayadaw visited Sayagyi's centre, he usually gave a short Dhamma talk every day. He once mentioned, "When we first visited this place it was like a jungle, but now what progress has been made in these years. It resembles the time of the Buddha when many benefited! Can one imagine how many enjoyed the fruits of Dhamma in a single moment? Can one count the number? Innumerable!" Because of his highly demanding government duties, Sayagyi was only able to teach a small number of students. Many of his Burmese students were connected with his government work. Many Indian students were introduced by Goenkaji. Sayagyi's students from abroad were small in number but diverse, including leading Western Buddhists, academicians, and members of the diplomatic community in Rangoon. From time to time, Sayagyi was invited to address foreign audiences in Burma on the subject of Dhamma. On one occasion, for example, he was asked to deliver a series of lectures at the Methodist Church in Rangoon. These lectures were published as a booklet titled “What Buddhism Is.” Copies were distributed to Burmese embassies and various Buddhist organizations around the world. This booklet attracted a number of Westerners to attend courses with Sayagyi. 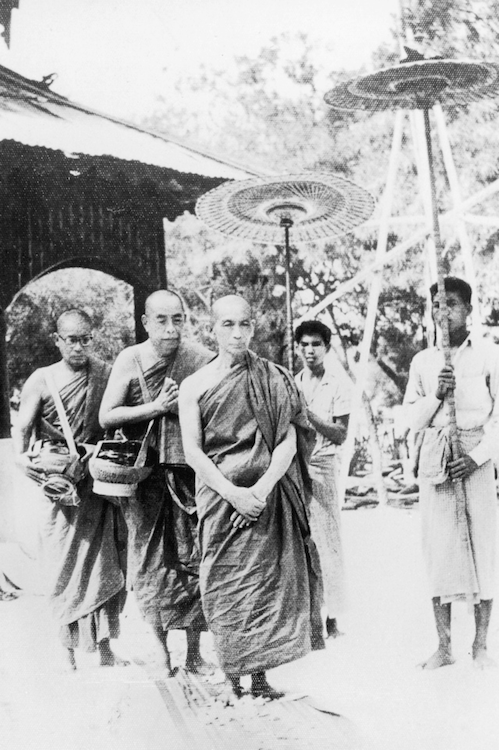 Sayagyi was active in the planning for the Sixth Buddhist Council known as Chaṭṭha Saṅgāyana (Sixth Recitation) which was held in 1954-56 in Rangoon. Sayagyi was a founding member in 1950 of two organizations which were later merged to become the Union of Burma BuddhaSāsana Council (U.B.S.C. ), the main planning body for the Great Council. U Ba Khin served as an executive member of the U.B.S.C. and as chairman of the committee for paṭipatti (practice of meditation). He also served as honorary auditor of the Council and was therefore responsible for maintaining the accounts for all dāna(donation) receipts and expenditures. There was an extensive building programme spread over 170 acres to provide housing, dining areas and kitchen, a hospital, library, museum, four hostels and administrative buildings. The focal point of the entire enterprise was the Mahā Pāsāṇaguhā (Great Cave), a massive hall where approximately five thousand monks from Burma, Sri Lanka, Thailand, India, Cambodia and Laos gathered to recite, purify, edit and publish the Tipiṭaka (Buddhist scriptures). The monks, working in groups, prepared the Pāli texts for publication, comparing the Burmese, Sri Lankan Thai, and Cambodian editions and the Roman-script edition of the Pāli Text Society in London. The corrected and approved texts were recited in the Great Cave. Ten to fifteen thousand lay men and women came to listen to the recitations of the monks. To efficiently handle the millions in donations that came for this undertaking, U Ba Khin created a system of printing receipt books on different coloured paper for different amounts of dāna, ranging from the humblest donation up to very large amounts. Only selected people were allowed to handle the larger contributions, and every donation was scrupulously accounted for, avoiding any hint of misappropriation. Sayagyi remained active with the U.B.S.C. in various capacities until 1967. In this way he combined his responsibilities and talents as a layman and government official with his strong Dhamma volition to spread the teaching of Buddha. In addition to the prominent public service he gave to that cause, he continued to teach Vipassana regularly at his centre. Some of the Westerners who came to the Sixth Council were referred to Sayagyi for instruction in meditation since at that time there was no other teacher of Vipassana who was fluent in English. Sayagyi finally retired from his outstanding career in government service in 1967. From that time, until his death in 1971, he stayed at I.M.C., teaching Vipassana. Shortly before his death he thought back to all those who had helped him—the old man who had helped him start school, the Burmese teacher who helped him join St. Paul’s and, among many others, one friend whom he had lost sight of over forty years earlier and now found mentioned in the local newspaper. He dictated letters addressed to this old friend and to some foreign students and disciples, including Goenkaji. On the 18th of January, Sayagyi suddenly became ill. When his newly rediscovered friend received Sayagyi’s letter on the 20th, he was shocked to read Sayagyi’s death announcement in the same post. After Sayagyi's death, Webu Sawadaw visited Rangoon and gave a private interview to about 25 students from Sayagyi's centre. When it was reported to the Sayadaw that Sayagyi had died, he said, "Your Sayagyi never died. A person like your Sayagyi will not die. You may not see him now, but his teaching lives on. Not like some persons who, even though they are alive, are as if dead-who serve no purpose and who benefit none." -Impermanent truly are compounded things, by nature arising and passing away. -If they arise and are extinguished, their eradication brings happiness. Sayagyi U Ba Khin’s aspirations are being accomplished. The Buddha’s teachings, carefully preserved all these centuries, are still being practiced, and are still bringing results here and now. As Sayagyi said, "The time-clock of Vipassana has now struck-that is, for the revival of Vipassana in practice. We have no doubt whatsoever that definite results would accrue to those who would, with an open mind, sincerely undergo a course of training under a competent teacher-I mean results which will be accepted as good, concrete, vivid, personal, here-and-now; results which will keep in good stead and in a state of well-being and happiness for the rest of their lives."